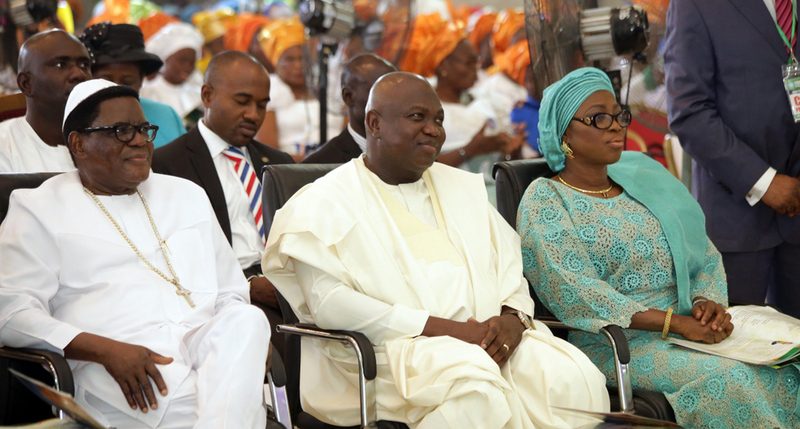 Lagos State Governor, Mr. Akinwunmi Ambode (middle); his wife; Bolanle (2nd right); Secretary, Christian Association of Nigeria (C.A.N), Lagos State Chapter, Elder (Dr) Israel Akinadewo (right); Chairman, C.A.N Lagos State Chapter, Apostle Alexander Bamgbola (2nd left) and Treasurer, C.A.N Lagos State Chapter, Bishop Stephen Adegbite (left) during the C.A.N Inter-Denominational Divine Service at the Shepherdhill Baptist Church, Obanikoro, Lagos, on Saturday, February 18, 2017. 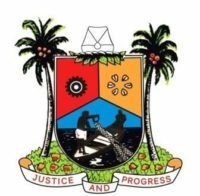 Wife of Lagos State Governor, Mrs. Bolanle Ambode; her husband, Governor Akinwunmi Ambode; Chairman, Christian Association of Nigeria (C.A.N) Lagos State Chapter, Apostle Alexander Bamgbola and Primate, The First African Church Mission, Most Rev. Sunday Oludare Matilukuro and his wife, Oluwatoyin during the C.A.N Inter-Denominational Divine Service at the Shepherdhill Baptist Church, Obanikoro, Lagos, on Saturday, February 18, 2017. 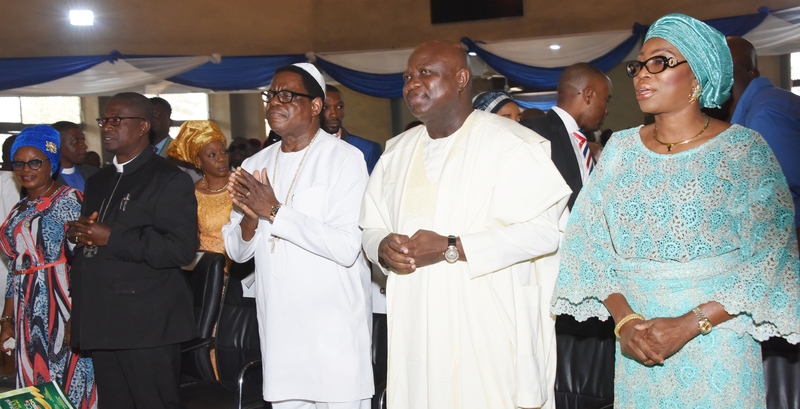 Wife of Lagos State Governor, Mrs. Bolanle Ambode; her husband, Governor Akinwunmi Ambode; Chairman, Christian Association of Nigeria (C.A.N) Lagos State Chapter, Apostle Alexander Bamgbola and Primate, The First African Church Mission, Most Rev. 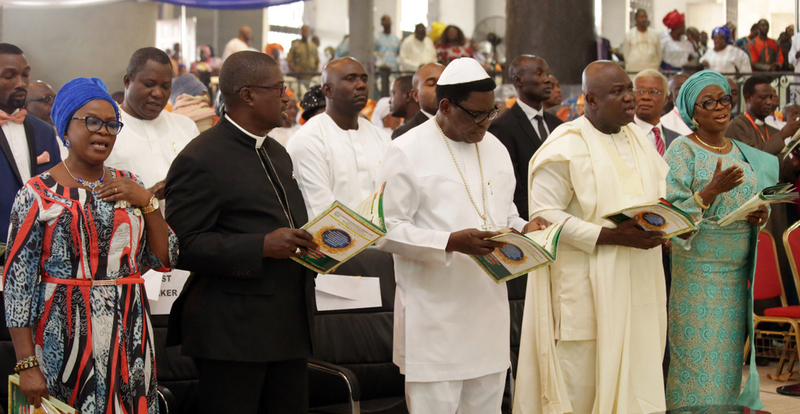 Sunday Oludare Matilukuro during the C.A.N Inter-Denominational Divine Service at the Shepherdhill Baptist Church, Obanikoro, Lagos, on Saturday, February 18, 2017. 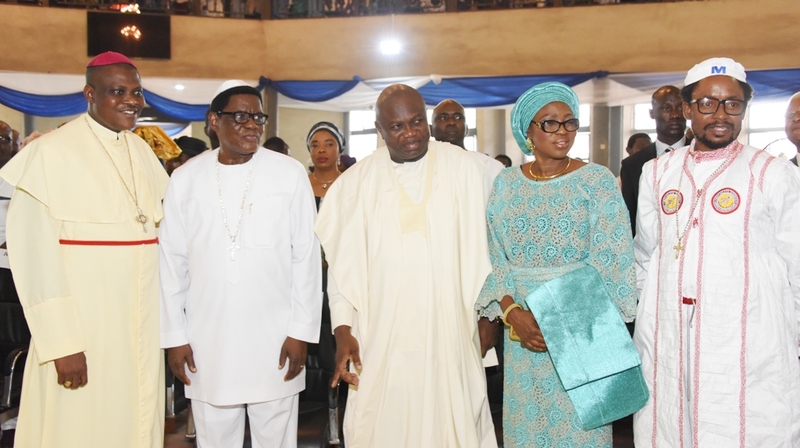 Lagos State Governor, Mr. Akinwunmi Ambode (middle); his wife; Bolanle (right) and Chairman,Christian Association of Nigeria (C.A.N) Lagos State Chapter, Apostle Alexander Bamgbola (left) during the C.A.N Inter-Denominational Divine Service at the Shepherdhill Baptist Church, Obanikoro, Lagos, on Saturday, February 18, 2017.